Some days just get crazy. Whether you work or like us you live a very active retirement, we don’t always feel like spending a lot of time in the kitchen to put a nice dinner on the table. To the rescue, Pasta, Pesto and Peas! Our little container garden has given us a bumper crop of Basil this year. We also had a handful of fresh garden peas and some edible flowers. So we thought why not make a meal that allows all the ingredients to shine on one simple plate! 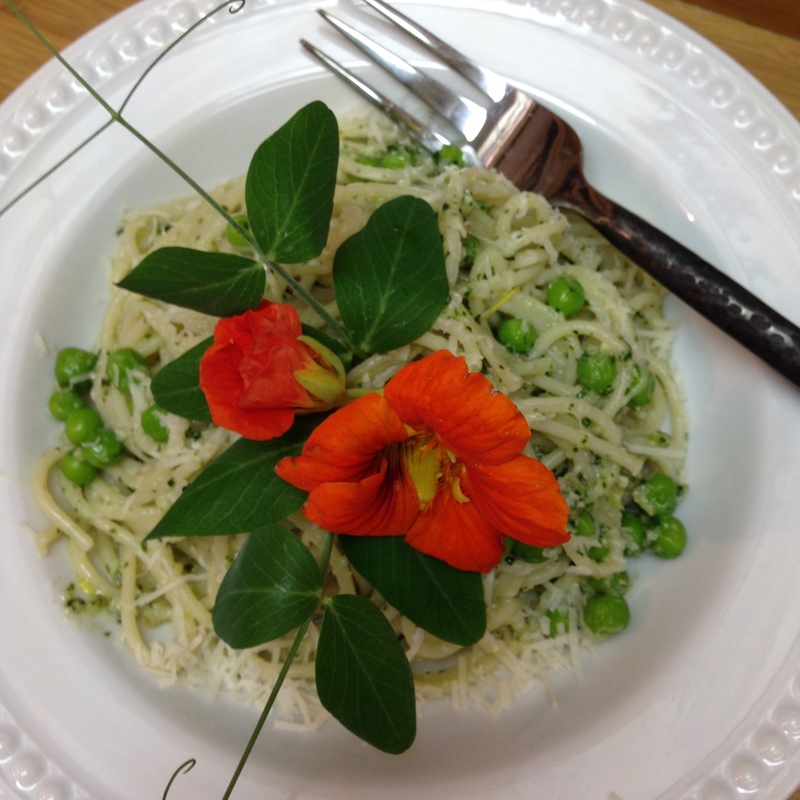 We created this dish using our recipe for Pesto. Just click the link for that part of the recipe. Set a pot of water to boil, and add plenty of salt to cook the pasta of your choice. Once the pasta is almost cooked, toss in the fresh peas for just a few minutes. when “al Dente”, drain the pasta and reserve about 1 cup of pasta water. Place the pasta and peas back in the pot, add half of the pesto and about a 1/4 cup of the reserved pasta water, stir to incorporate everything. Taste it. Do you need more Pesto? add a bit more as well as more of the water. The water helps create a sauce for the dish. We normally make Pasta for 2 so we only use 1/2 the Pesto recipe. If you are making it for 4 people, use it all. What the heck, everyone will have garlic on their breath anyway! 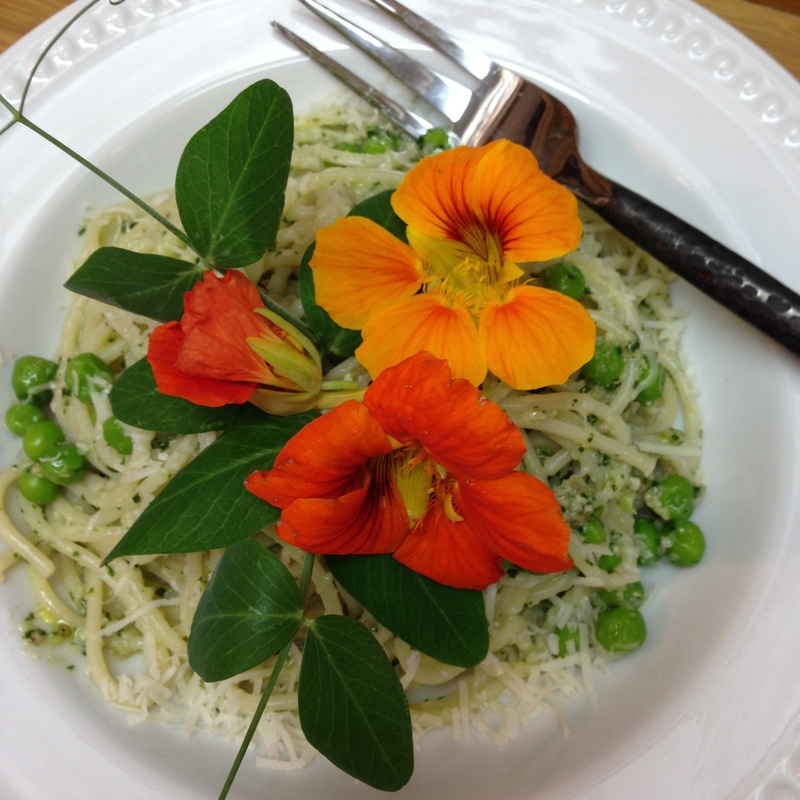 Cook’s Tip: You can add interest to a simple plate by using edible flowers to garnish. We grow nasturtiums and we also grow peas, so using the pea shoots with the edible flowers makes something special out of the ordinary! Nasturtiums taste quite peppery! Try them. 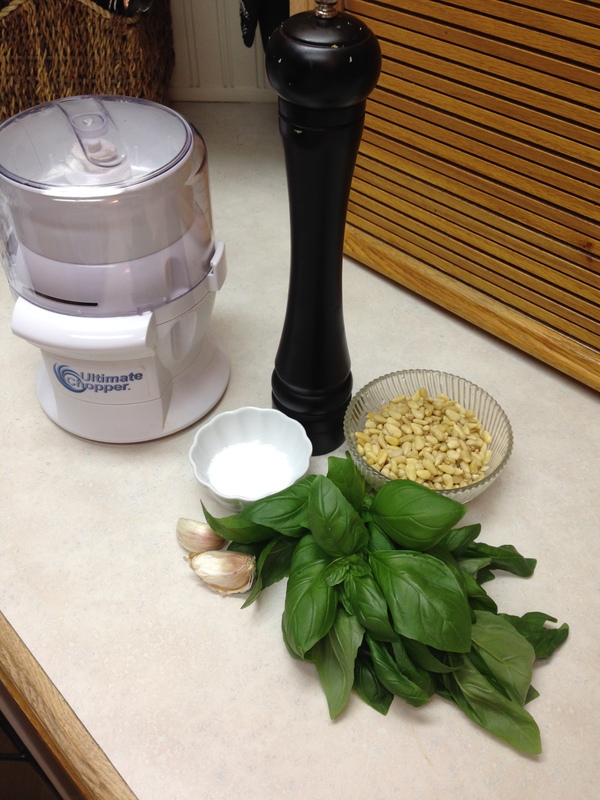 Garnish with a few fresh basil leaves, grate some Parmesan cheese on top and Presto! You have Pasta, Pesto and Peas! This entry was posted in Dinner, Lunch, Meat Free, Uncategorized, Vegetables and tagged Home made pesto, Pasta, pasta dish, pesto. peas, simple suppers., vegetarian meals. Bookmark the permalink.